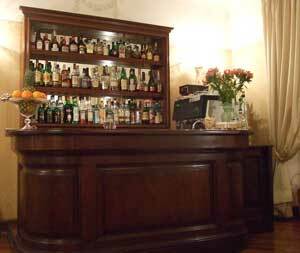 Hotel Tornabuoni Beacci is a good, old-fashioned three-star hotel in the centre of Florence, with 28 guest rooms. I stayed at the hotel for two nights in December 2008, having booked online the day before. I selected a standard double room for €85 a night; not a bargain at this time of year, but still a reasonable and competitive price. Hotel Tornabuoni Beacci is situated in a historic building on Via Tornabuoni, Florence's most fashionable shopping street. Small lifts take the visitor up to the reception area on the fourth floor. There are always staff on duty during my stay, and they are friendly and helpful. The hotel, which has a traditional, family-run atmosphere, is a small warren of rooms, nooks and staircases carved out of several storeys. It is furnished in a pleasantly old-fashioned style with shiny brass fittings, art reproductions, Victorian-style pot plants and carpets. There's a nice little bar serving hot and alcoholic drinks, at reasonable prices. They know their foreign guests here, and the caffe americano is just what English-speakers like. As well as a few armchairs dotted around landings and corners, the hotel also has a comfortable lounge. Best of all, though, is the roof terrace. Bedecked with flowers and furnished with tables and chairs, this is a lovely space with views over the rooftops. At a warmer time of year, this must be a wonderful place to savour a glass of Chianti after a hard-day's gallery-visiting. The hotel does have a restaurant, but this isn't open in winter months. My bedroom is reached via corridors, corners and steps. It's the nature of things with historic buildings, but the number of steps means this hotel would be tricky with reduced mobility. The first time I open my door into the unlit bedroom, I nearly fall forwards; there are two steps down into my bedroom from the corridor and also from the bathroom. Apart from this inconvenience, I am pleased with the bedroom. It's a decent-sized double by Italian standards, without the furnishings or outlook that would encourage you to spend hours in it, but it is comfortable. The window looks out over the rooftops of Florence, and over the hotel's charming terrace (sadly unusable in rainy December). Walls are white-painted with some blue-paint and plasterwork decoration. There's an air-conditioning unit and a radiator; the weather is cold and wet but my room is perfectly snug and warm. Like the rest of the hotel, the room is in a traditional (or old-fashioned) style, but clean and fresh and without fuss. There are a few marks on the wall from visitors' suitcases and, high up, a couple of squished mosquitos. In Florence - as in so much of Italy - mosquitos can be a problem; the window has a mosquito grille outside it (I still get bitten but I'm not sure I can blame the hotel). There is a suitcase stand, two low-backed chairs, a small writing desk, two bedside tables with lamps and a small television set (CNN is the only non-Italian channel I can find amid the fuzz). The wardrobe is built into an alcove with small shelves set into it. There isn't a chest of drawers, nor a coat-hook, which would have been useful. There are full-length mirrors inside the wardrobe doors, and a safe. The double bed has sheets, a blanket and bedcover - there is a spare blanket and pillows in the wardrobe. The bathroom is fairly small but not impracticably so. There's a good shower, hairdrier (not very efficient), toilet, washbasin, toiletries and decent towels. Continental visitors would note the omission of a bidet. During my stay I also visit a slightly larger and smarter double room, at the front of the hotel. 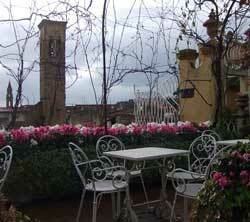 This has views over the centre of Florence, from Brunelleschi's famous dome to the church of San Miniato on its hill. There are no awkward steps in this room, and furnishings are slightly smarter: a better hairdrier in the bathroom, a bathtub with shower overhead, a chest of drawers. I couldn't find many negative points for this hotel. Personally I prefer the totally non-smoking establishments which are becoming more common in Italy, as I did smell cigarette smoke in the corridor at one point, and find a tiny burn hole in the bedcover. Bedroom doors were old-fashioned and not sound-proof, though in my case my bedroom was very quiet and its out of the way location probably helped. The hotel's breakfast room is at the front of the building, and it doesn't get uncomfortably busy during my stay. 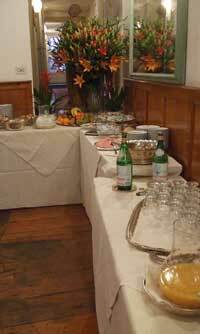 The hotel provides a decent cold buffet, which is good by Italian standards. A waitress was on duty to provide hot drinks, and guests could help themselves to the food on offer, which includes ham, cheese, cereals, yoghurts, croissants, rolls, fresh fruit salad, orange juice and fresh fruit. 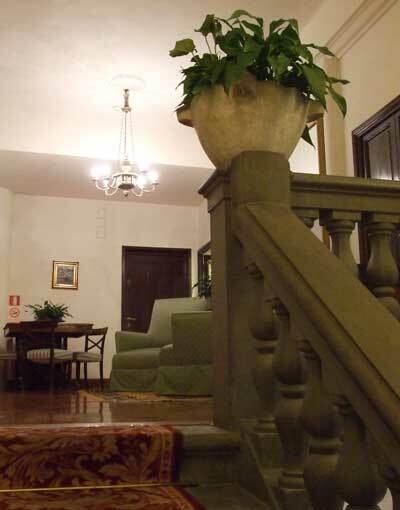 Hotel Tornabuoni Beacci is between the railway station and the heart of historic Florence. It is on Via Tornabuoni, Florence's most fashionable (and expensive) shopping street, and is identified by a fairly small sign by the large doorway. The hotel's reception is on the fourth floor, reached by small lifts. This is an excellent location, and not just for shoppers. Narrow medieval lanes head in each direction from Via Tornabuoni, dotted with interesting small shops, historic buildings and places to eat. The Ponte Vecchio is just a few minutes' walk away, and so are the other sights of central Florence including the Uffizi gallery. It is also easy to reach - perhaps a ten-minute walk - from the main railway station, Stazione Santa Maria Novella. You don't need to walk far for anything - and I'd recommend a small restaurant just over the road on Piazza Santa Trinità, called Le Antiche Carrozze. The hotel is charming and has a delightful old-fashioned air while still offering modern efficiency, cleanliness and comfort. Travellers should bear in mind that its layout involves steps and staircases. It's like a smart version of the traditional pensione; comfortable and affordable without being luxurious. The location is great and it is easy to imagine past generations of visitors to Florence - like the characters of A Room with a View - sitting straight-backed in the lounge and planning their tour of the Uffizi. 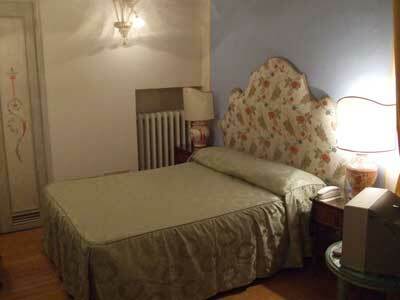 I would highly recommend the Tornabuoni Beacci for visitors looking for a good central hotel with cosy character. Hotel Tornabuoni Beacci review by an Italy Heaven editor.